On Monday, 22nd September 2014, at 10 a.m., the first bike- marathon started at Mansoura University. This event comes as an initiative to encourage the staff members, employees, students, and community members to ride bicycles. · Preparing a comprehensive study in cooperation with the Faculty of Engineering with the purpose of planning the streets of Mansoura city to offer safe lanes for bicycle riding. · A university showroom for budget-bike selling. · Printing and distributing a manual booklet for purchasing bicycles and bike- riding code of ethics. The participants, on their bikes, formed groups: the first included the university top-leaders, prominent figures, teaching staff, and employees; the second: Dakahlia Sports- Zone bikers; the third: participating teams; the fourth: students of universities and schools. The marathon was witnessed by many spectators, nationals of Egypt and of other Arab countries. 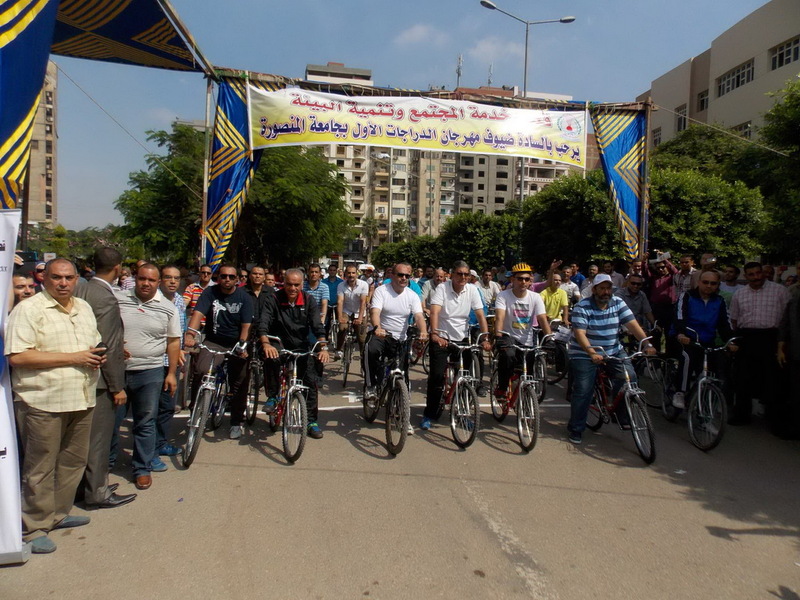 The bike – marathon toured Mansoura University campus. Due to the success of the event, the Sector for Community Service and Environment Development is now preparing a second bike – marathon to take place during the second half of October 2014.